Top Java poker rooms of 2019 table. A quick note about this table. In the table above, I have also included a list of the best Flash-based sites. I'm guessing that the majority of players searching for "Java poker sites" or "poker on Java" are just looking for the best places to play online poker in their browser, rather than looking for Java rooms specifically. Flash is another popular method used by poker rooms to offer their browser-based rooms, so I thought I'd list them on this page too. Both Java and Flash options are just as good as each other, so just choose the room you like the look of the most. How to play at Java poker sites. 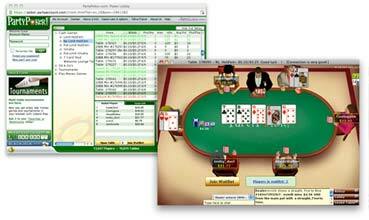 As you already know, Java poker rooms allow you to play online poker in your browser. So all you need to play at a Java-based room is... a browser. Just visit the poker room you want to play at, and select the "instant play" version. You could be using Internet Explorer, Firefox, Chrome, Safari or Opera -- they'll all work fine. You could be running Windows, Mac or Linux (e.g. Ubuntu) too -- that's fine as well. As long as you're using a browser that has Java enabled, you're good to go. Is Java enabled in my browser? Probably. Actually, not just probably… very probably. I just looked at a few stats about poker players visiting this site, and it shows that around 80% of all visitors have Java enabled. Plus, a decent portion of those visitors are on a mobile device that doesn't support Java (e.g. an iPhone). 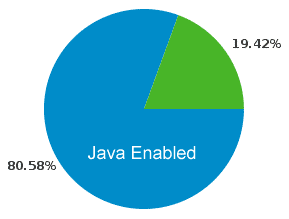 The percentage of visitors to ThePokerBank.com that have Java-enabled browsers. So if you're on your Laptop or Desktop, it's likely that you've got Java enabled and can play at any of these sites listed in the table above. I'd just go for it and try and start playing -- the room will let you know if you're able to play or not, and 9 times out of 10 you'll be fine. Enabling/installing Java in your browser to play poker. Google the phrase "enable Java + your browser". This will return a list of results with helpful guides to getting Java working. It's usually just a case of going in to the settings and changing a few options. Visit the Java.com website. This place has helpful enabling Java in your browser and Java install guides. So if Googling the problem didn't work, try those links out. Play with the settings yourself. Probably not the best idea if you're not great with computers, but if you know what you are doing there's no reason why you can't search around your browser's settings/preferences for yourself. Java poker compared to downloadable clients. A screenshot of the Java version of Party Poker (being played on a Mac using the Google Chrome browser). In a nutshell, these Java rooms are usually a little more "lightweight", and do not offer as many features as the fully-fledged downloadable clients. This is not a bad thing, it just means that you don't get to take advantage of some of the more advanced stuff. For example, you may not be able to multi-table as many tables, or be able to use an instant hand replayer. Play online poker wherever you like quickly and easily. No need to download and install any software. Less features than the full version. If you're a regular online poker player, you're usually going to be better off with a downloadable client. But for everyone else, Java poker sites are super handy. Java is a popular programming language used to develop web-based applications. Basically, Java is a programming language that can be used to make online games and other interactive stuff like that. It's also free to use for programmers and everyday people like you and me, which is nice. It's been about since 1995 as well, so unless you've been exiled from technology for the last 10+ years you've definitely come across it before. Here are some applications or "applets" you may have heard of. Each of these has been written in Java. There are plenty of other examples out there, but these are the most popular ones that I've found. System.out.println("Hello World! "); // Print "Hello World!" I think I'll just stick to writing strategy and playing poker.